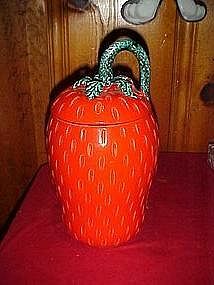 Awesome pottery cookie jar in the shape of a big tall red ripe strawberry. Very unique compared to any other strawberry cookie jars you will see. This one measures 12 3/8" tall and is very heavy. Made of a light color red clay with a nice glaze. The stem is very artistic on its own, with the mottled green coloring. You can see by looking at the inside that it was made on a potters wheel. No makers marks. Perfect other than one very small chip under the rim which is very hard to see.